Deputy Foreign Minister says Abbas will never make peace, supports Netanyahu on Hamas ceasefire. 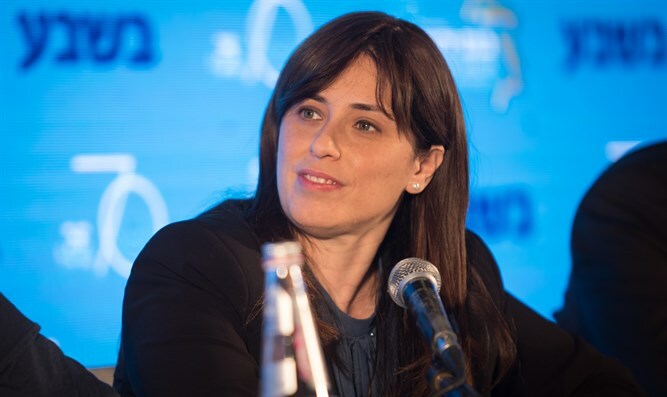 Deputy Foreign Minister Tzipi Hotovely responded to the resignation of Defense Minister Avigdor Liberman Thursday. "This is one of the cynical political moves that have been seen here," Hotovely told Arutz Sheva. "A political maneuver to exonerate itself in an election year over a campaign that is currently under way. I think we have never suspected Liberman of being an ethical person, but I feel this is a new record of cynicism, of preferring personal interests over the national." "Since this is the situation, I think we should be happy that the defense minister has vacated his seat, and with the help of God, I hope there will be a more worthy person there, and I have no doubt that anyone who will replace him at this time will come from a more national place that gives more weight to state considerations. "We are in a very sensitive period and I think there is a point in continuing this government if we really all unite and understand that there will be another significant period in which to achieve achievements. Hotovely expressed her desire to assume the position of Immigration Minister in the next government. "I see myself as someone who wants to be a partner in the government and also to take on a significant role, the immigration and absorption portfolio, which is now a case that is being vacated by Yisrael Beytenu's retirement, and I can see myself as a minister. But we really will continue in this story only if everyone accepts responsibility and understands that we have to continue until November, but if the business is going to break down very quickly then perhaps we should all go to elections, but as I said the national interest is to continue until the original election date." Hotovely is not impressed by Jewish Home leader Naftali Bennett's demand to receive the defense portfolio. "I do not like ultimatums. I think we should do it in a much more collegial way. We are a government in which all of us are right-wingers and want to continue the right-wing government. The national interest at this time when we have a sympathetic president in the White House, when we have so many challenges, even in the field of security, also achievements in the field of policy, is that the government will not shorten its days and will hold elections on time. It seems very difficult and impossible at the moment, but if everyone puts the national interest before the personal interest, I think we can get there." "I did not like Bennett's ultimatum. I think it could have been done differently even if he really wanted the defense portfolio. At the end of the decision is the prime minister's. Hotovely said that understands the anger of the residents of the south, but backed up the prime minister's policy in avoiding a further buildup in Gaza. "They deserve a serious response to the missile threat. We saw only this week a rocket that fell on a kindergarten and houses that received direct hits. All of these things indicate that our enemies are determined to cause harm to our lives and we have to give it a response. I can tell them that the battle in Gaza has not ended and the military operations will resume." "I have no doubt that we are only in the middle of this path and the prime minister, in my opinion, was referring to this at Ben-Gurion's memorial when he said that in times of crisis decisions must be made in secret. Part of our way to fight the cruel terrorist organization is to choose the time when in is most convenient for us to carry out the operations in order to achieve military achievements as large and as possible as possible. Hotovey addressed reports that President Trump's peace plan is to be presented in the coming months. "In order to make peace, we need two sides, and it is clear to all of us that the Palestinian side is not interested in peace and does not want peace. The American plan has not yet been laid on the table, and Abu Mazen (Mahmoud Abbas) has already said openly and publicly that he intends to reject any American plan that will be presented. "So it is quite clear that an American plan, if presented at this time, will end up in the drawer. It can not really lead us to any arrangement and agreement between the two sides. I think that our job at this time is to achieve stability in the disintegrating Middle East. We need to maintain a strong Israeli presence that is really blocking the entry of radical Islam into more and more places. Jordan and Egypt are interested in our presence and other Arab countries view Israel as a positive force. "We have to stop working based on the old formulas. In the whole area of ​​peace arrangements, we need to think in a new way and not recycle the programs that do not work. The two-state solution proved that it failed and we need to repeat the word 'stability' today. The word 'peace' is not relevant in this era. "